Australian Feral Management can advise on the best course of action where feral/wild dogs are causing a problem. Australia’s wild dogs include dingoes, introduced around 4000 years ago, feral domestic dogs and hybrids between the two. They are widely distributed throughout Australia. Predation and harassment of stock by wild dogs causes millions of dollars worth of losses to Australian sheep, cattle and goat producers each year. There are increasing accounts of deer hunters, campers and bushwalkers getting bailed up by dogs and now no animal seems to be safe from attacks. 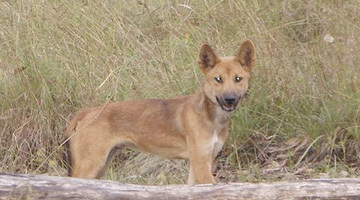 Where breeding between domestic dogs and dingoes has been more extensive, some physical changes have occurred to the dingoes. There is now a much greater range of variability to be found in characteristics such as skull shape, body conformation and coat colour. This has caused problems in classification and the term wild dog is now often used to collectively describe the present canid population.